Announcing the Top 10 most visited pages on CoyoteMusic.com in October 2012! The month of Hallow's Eve. The 10th month. The home to Octoberfest, Rocktoberfest, Bocktoberfest. Aw, hell, it's just plain ol' October. And when it comes to the ten most-visited pages on our site, the corn lovers rule again. 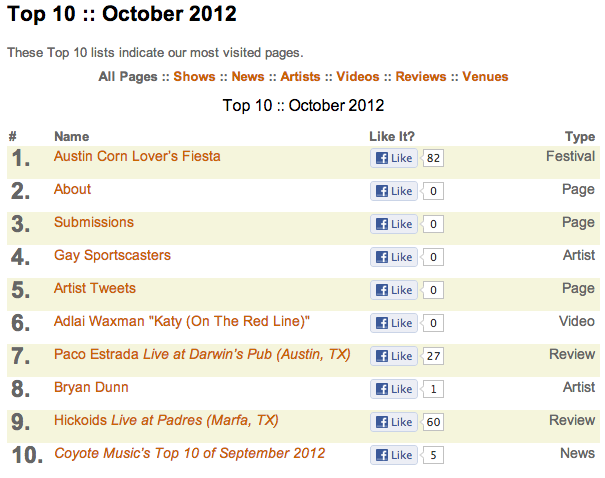 The Austin Corn Lover's Fiesta (aka "The Real ACL") took our top spot for the second month running. Then, apparently some are actually into the things we do—Coyote Music's "About" and "Submissions" take the second and third places, respectively. Among our Artists, the Gay Sportscasters (4) and Bryan Dunn (8) caused a ruckus, and our Artists Tweets page (5) also drew some seductive glances. Nashville's Adlai Waxman's plaintive song and its accompanying performance video for "Katy (On The Red Line)" snuck into the six-spot. And the review of Paco Estrada's two-man acoustic show at Darwin's Pub in Austin held down the #7 spot. At #9, the Hickoids metaphorically pantsed the small West Texas town of Marfa, in this review of their show at Padre's during Viva Big Bend. And rounding out the crème de la crème was our own "Top 10 of September 2012" News post. Thanks for reading along, and have a great November. Don't forget to check back next month to see what attracted your clicks throughout the month.